Aside from the “I will be more active next year,” Or, “I will adopt more healthy habits next year,” I’ve decided that I’ll be improving my mindfulness/awareness habits. I will be more present to whoever I’m with. I’ve been observing myself and others around me. Over the recent years, with the invasion of smart phones into our lives, and now, the android tablets too, we tend to half-listen and half-gaze at whoever we’re with and do half-peeks and half-browses into our smart devices, all at the same time. I wonder if it has become socially acceptable in some circles. The latter would be a shame. 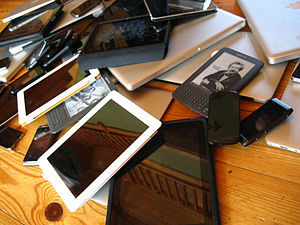 We used to shake our heads in disbelief when our children, mere middle-schoolers at the time, would be doing their homework in front of a computer, IM-ing 8 people at a time, then browsing on the Internet, with the TV on, while simultaneously listening to their music on their iPods at full volume. That was maybe 7-10 years ago. Now, we have become our children! It is not unusual for me to be watching a Netflix movie with my hubby on the big flat screen TV in our family room with my iPad on my lap ready to Google any interesting tidbits mentioned in the movie or the actors starring in it. Or, I could be on the page of a Kindle book I’m reading or browsing a digital magazine I’ve subscribed to. On the side rests my smart phone device so I can receive or send calls or text messages. If someone from the 1960’s saw this, they’d be shaking their heads in wonderment. We have certainly taken multi-tasking to a totally different level. It should be called Multi-tech-tasking maybe. But, does it really make us better at extracting information? How much do we absorb or retain? Sometimes I wonder if like sound-bites, we now only experience info-bites, never really having comprehensive knowledge of anything, just little bits of everything, not enough to have a good conversation about the topic or even take a stand on it. What a scary thought! My daughter, who was visiting with us this past weekend, was totally floored when her dad sent her a text message. She was in her room and he was in the kitchen. “So he doesn’t have to holler across the hall,” I teased, with a wink. She sighed and shook her head. I see people dining in restaurants with their smart phones in their hands all the time. For the twosomes, I wonder if they’re sending text messages to each other across the table. Maybe that’s the mode of conversation people are more comfortable with these days versus having an actual conversation in real-time. Or, they could be posting on Twitter or their Facebook wall what they are experiencing at the very moment? Wait, who’s more important here? The person you’re with or the perceived multitude somewhere who are likely doing other things? How much of an ongoing conversation do we really get involved with if we’re half-listening and half-paying attention to what someone is saying right in front of us? The more important question is, how much connection to we really make with this person, not just on one level but many many levels? Like the level where the spoken word does not reach? More the level of the nuanced gestures and glances? Of how a comment has been framed? In a certain context? And how much of it gets captured in our psyche and stored in our memory banks so we can draw upon it at will, on a later time? Surely, unless we have memories like computers, we can’t remember every single repartee but we can remember how we felt or the general direction of the conversation. And so, for 2012, I am going to challenge myself to have more presence, especially when I’m with people who matter to me. I will put away the distracting-addicting-obsessive devices. I will experience a film, book, magazine, etc. in its entirety, in one sitting. I want to remain connected, to others, to me, to the world. This entry was posted in attentiveness, Culture, Issues & Trends, mindfulness and tagged Android, Culture, Daily Post, IPod, Issues & Trends, mindfulness, Mobile phone, Netflix, postaday2011, postaweek2011, Smartphone, Twitter. Bookmark the permalink. This is a subject that’s baffling me. After all, I’m 77. I can only say, all these changes come a little bit too fast for me. I love my computer keyboard though because my handwriting has never been good. I rather type. And a computer keyboard is so much better than the old typewriters. I like to look up words on WordWeb and I like to google for information. When I write or read something I like to be undisturbed! I do not want a mobile phone for myself, because I cannot handle the small buttons. If I could handle one, I certainly would want to strictly limit its use. I found out that I love E-books. They’re great! It’s great to be able to access so much information so easily. But what I’m concerned about is our falling into the habit of being happy with little bits of information. Or, half listening only to people who matter to us, because we can’t keep from browsing, texting, reading and responding to emails all simultaneously.